We can admit that medicine can be a very litigious profession. Many of us trust our doctors to know everything that is wrong or could be wrong with us, and we often do not want to disrupt that trust. At the same time, we tend to have such high standards for our doctors that if one little thing goes wrong (a human error), many of us will often claim malpractice and sue our doctor for all he or she is worth – including the entire private practice. Medical Malpractice Lawyer This means that many doctors have had to carry millions of dollars in malpractice insurance, and resort to taking more tests and exams than might be really necessary to exercise every ounce of due diligence should a lawsuit arise from human error. 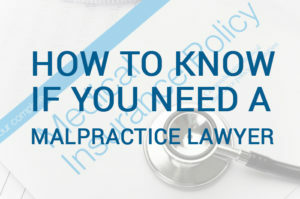 Medical malpractice lawsuits can be quite common, but before you jump right into such a thing, we want to provide you some key things to look for that could suggest malpractice. Human error is one thing, but to do several of these things might signify a problem with your doctor that goes beyond just human fallibility. Diag-delay. If you find your doctor is taking longer to come up with a diagnosis than he or she usually would, then this could be a warning sign. Combined with one or more of these other signs, it might be a good idea to have a lawyer on call. This is especially true if the doctor is taking longer to diagnose and is not suggesting any new tests to try to determine what’s wrong. Treatment failure. A doctor makes a diagnosis, and usually prescribes some treatment or medication as a result. However, if you stick to the treatment directions and you don’t notice improvement in your health, then thiscould mean a misdiagnosis. Lab test reliance. Human error doesn’t just come from doctors; labs which analyze blood work, urine, and stool samples, are also staffed by humans. Errors can happen, and if your doctor seems to have 100 percent trust in the lab results, then this could be an issue. When a doctor makes a diagnosis based on a single lab analysis, insist on a third-party, independent lab conducting the test. Sub-standard care. Every patient usually goes through a basic set of tests to try to narrow down possible diagnoses, and then when certain things are eliminated, more specialized tests are administered to get more specific. But if your doctor seems to skip past the basic blood work or X-rays and yet seems to have an idea of your diagnosis, then this should raise flags. Always make sure to ask about these basic tests, and if one was not given to you, find out why. You deserve at least a standard of care, and you have the right to know why the protocol was deviated from in your case. Follow-up? Good doctors will have follow-up appointments with you, during your treatment period, and especially afterward to find out your progress and to answer any questions about your condition and next steps. A doctor who does not offer or mandate a follow-up is a doctor who might not be entirely straight with you. This is your health, and you deserve and have a right to know what is happening and receive answers to your questions. If your doctor is displaying any of these signs to you, or especially multiple signs, then it does not hurt to take advantage of a free consultation with a quality medical malpractice lawyer who can help you determine a diagnosis and what you can do next to make sure you get the care you deserve. If you are in Florida, you can take action now and make sure your rights are protected by contacting us for a free consultation and a neutral assessment of your situation so you get the best outcome possible.